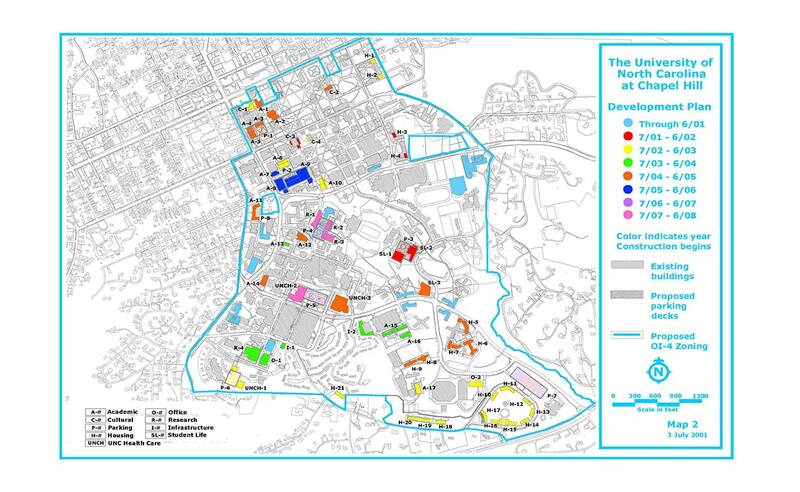 The Campus Master Plan provides the University and UNC Health Care System with a framework for planned growth. The Campus Master Plan seeks to export the planning principles of the historic north campus to the south by extending the open space network and strengthening the north to south pedestrian connections. It locates new buildings that define new open spaces. (See attached Map 1.) The design guidelines will recommend footprints and heights that are sensitive to the scale of adjacent buildings and on the boundaries of the campus adjacent to neighborhoods. The transportation, environmental and utility components of the Campus Master Plan address the parking, transportation, and utilities infrastructure demands of this growth while also providing a strategy to protect the environmental resources of the campus and region. The Development Plan is a significant first step in the implementation of the Campus Master Plan. This plan proposes buildings that support the University and UNC Health Care System’s mission of teaching, research and service. New buildings for academic, research, health care, student life programs and additional student housing address documented space deficiencies for existing programs and provide additional space to meet the University’s increased student enrollment. The Development Plan is a comprehensive plan that includes projects to meet programmatic needs as well as infrastructure projects that support and mitigate the impacts of growth. The Science Complex is an example of comprehensive planning that addresses a series of challenges. Phase I will build updated science facilities to accommodate the current occupants of Venable Hall. Once completed, Venable Hall will be vacated and demolished. Phases II and III will then provide academic and research space to address significant space deficiencies. Also included in Phases II and III are a chiller plant to meet the increased cooling load and a parking deck to replace surface parking eliminated by construction. Some of the existing surface parking will also be transformed into a new quadrangle. The Development Plan also includes projects that extend the pedestrian and open space network and export the character of north campus to the south. The Ramshead Development and Student Services Building provide space for student life programs to support the students who will live in the new and existing residence halls on south campus. Again, the buildings for program are coupled with infrastructure projects that replace lost parking, extend the utilities distribution network and introduce storm water management systems to mitigate this growth. The roof of the parking deck is designed as a new open space that is formed by new buildings for campus recreation and dining. Existing pedestrian paths are extended through this open space and connect to the network of open spaces formed by the new residence halls and existing high rises. The Development Plan provides a comprehensive plan to provide additional housing for students and student families. During the Campus Master Plan additional on campus housing was identified as one strategy to reducing the number of cars coming to campus. This additional housing also answers the University’s commitment to provide housing for the increased undergraduate enrollment. From the first concept plan for the Campus Master Plan, student family housing has been seen as an appropriate neighbor to the Mason Farm neighborhood. There is a carefully sequenced schedule for new construction of housing that supports the renovation schedule of existing undergraduate residence halls. The University commitment to improving student life on campus is evident in the development plan. The plan will transform south campus from the bedroom community it is now and new development will bring the character of open spaces and rich intellectual climate to this part of campus. Planned development for the UNC Health Care System is designed to meet the needs of patients from the local community, region, and state. One example is the replacement of the Clinical Cancer Center. This project will allow for decompression and expansion of care programs for people with cancer, while also providing an opportunity for demolition of the Gravely Building and the creation of green space in front of the UNC Hospitals complex. This new park setting will become part of the south campus open space network. The UNC Health Care System’s new facilities are planned to respond to the need and demand for health care.